[See our Beachs - Click Here] The vacation rentals are only 50 yards from 2 popular Kauai South Shore sandy beaches with fantastic snorkling and surfing. Prince Kuhio Beach has excellent swimming, snorkling, and diving and is famous for the sea turtles you swim with while snorkling. Sometimes you can also see whales breaching and frolicking in the distance. The other, Lawai Beach, is one of Kauai's top snorkling beaches but also has 3 prime surf spots: PK's, Centers, and Acid Drop. The surfers and body boarders are regulars at this part of Kauai's Poipu Beach. Wall-to-wall windows in the bedroom and wall-to-wall windows in the living room make our large vacation rental condos so unusual. There is a continuous breeze from the trade winds that flows from the bedroom through the condo and out the living room. Our condos are very light and airy! 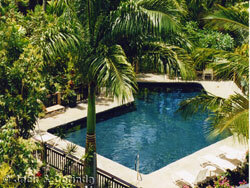 The swimming pool is surrounded by a tropical garden and ponds. The ocean is only a few yards away from our vacation rentals. The ocean view from the lanai is unobstructed since there is nothing between you and the ocean but the park and a few palm trees. There are also excellent views of mountains and the park. 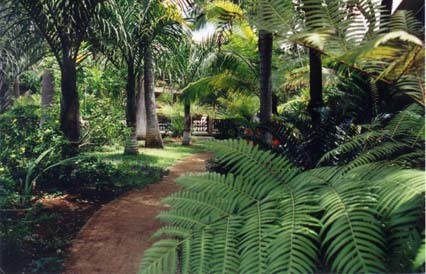 The tropical garden comes right up to the resort on the other side opposite the park where you will find the pool. [Tropical Garden Pictures - Click Here] You can hear the birds singing and playing in the park and the waves crash in the ocean beyond. The tropical garden in front comes right up to the building and is full of exotic flowers. There are also many varieties of palm trees and rare, exotic plants and ponds. This garden and pool are on the front side of the resort and give it the tropical paradise look! Our vacation rental condos range in price from $145 per night at the weekly discount rate. This is the best value on the island given the location and accommodations. For more information about rates and policies, please see our individual vacation rental condo listings. There are only 71 units in this friendly resort. You can relax and enjoy your vacation. The resort is very quiet and the people are exceptionally friendly. [Pictures of Park - Click Here] The large historical Prince Kuhio Park borders one side of the resort and goes streight down to the ocean. That gives our vacation rental condos an unobstructed ocean view. This Kauai city park is historic and popular with the locals. We enjoy the birds, mountain views, ocean views, and gorgeous sunrise from the park. Entertainment is within minutes of this central location. Two golf courses are less than five minutes away - Kiahuna Country Club, and the championship Poipu Bay Resort Course - site of the 1998 and 1999 PGA Grand Slam of Golf. For open ocean dives, as well as sport fishing, sailing, and ocean tours, go to the nearby Kukuiula Harbor for charters. Tennis lessons, matches, or round robins can be arranged at either the Kiahuna Tennis Club, Poipu Kai Resort, or the Hyatt Hotel Tennis Club - all within a short five minute drive. A variety of restaurants and shops are a few minutes away in Old Koloa Town (circa. 1830) or the Poipu Shopping Village. Also dinner is served right next door at the Beach House Restaurant - highly rated for good food and magnificent Poipu sunsets. 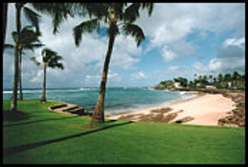 The Kauai Visitor Information for the South Shore lists many of the attractions in the immediate area. Our vacation rental condos has a large laundry room on the ground floor reserved exclusively for our guests. There is a large, brick BBQ in the garden below with picnic table surrounded by plants and flowers. There is convenient parking in front and covered parking through the garden reserved exclusively for our guests at Prince Kuhio Resort. The kitchens are fully equipped with many appliances such as blender, microwave, toaster, coffee pots and all the utilities and supplies. Linens, towels, beach towels, are all supplied. There is Cable TV, VCR, great stereo with CD player, and ceiling fans.